A capital gain is an increase in the value of an asset or investment resulting from the price appreciation of the asset or investment. In other words, the gain occurs when the current or sale price of an asset or investment exceeds its purchase price. 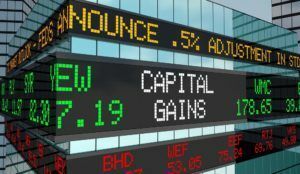 Capital gains are attributable to all types of capital assets, including, but not limited to, stocksStockWhat is a stock? An individual who owns stock in a company is called a shareholder and is eligible to claim part of the company’s residual assets and earnings (should the company ever be dissolved). The terms "stock", "shares", and "equity" are used interchangeably., bonds, goodwillGoodwillIn accounting, goodwill is an intangible asset. The concept of goodwill comes into play when a company looking to acquire another company is willing to pay a price significantly higher than the fair market value of the company’s net assets. The elements that make up the intangible asset of goodwill, and real estate. Capital gain can be realized or unrealized. The realized gain is the gain from the final sale of an asset or investment. Conversely, the unrealized gain arises when the current price of an asset or investment exceeds its purchase price, but the asset or investment is still unsold. Note that only realized capital gains are taxed while the unrealized (capital) gains are merely paper gains that are usually subject to accounting reporting but do not trigger a taxable event. Additionally, realized capital gains are usually classified as short-term gains and long-term gains. Short-term (capital) gains occur if a sold asset or investment was held for less than a year. Long-term (capital) gains are gains from the asset or investment that was held for more than one year. Realized capital gains are considered taxable events. Most countries impose special taxes for the realized gains levied on both individuals and corporationsCorporationWhat is a corporation? A corporation is a legal entity created by individuals, stockholders, or shareholders, with the purpose of operating for profit. The creation involves a legal process called incorporation where legal documents containing the primary purpose of the business, name, and location. However, for the gains of investment funds such as a mutual fundMutual FundsA mutual fund is a pool of money collected from many investors for the purpose of investing in stocks, bonds, or other securities. Mutual funds are owned by a group of investors and managed by professionals. Learn about the various types of fund, how they work, and benefits and tradeoffs of investing in them, the tax on the gains is imposed upon the fund’s investors. Generally, the holding time of an asset or investment affects the tax rate applicable to a capital gain. For example, if the gain is short-term (as defined above), it is taxed at the ordinary income tax rate. On the other hand, long-term (capital) gains are usually taxed at a lower tax rate. For example, if the ordinary tax rate is 35%, the capital gain can be taxed at a 20% rate. Taxable IncomeTaxable IncomeTaxable income refers to any individual's or business’ compensation that is used to determine tax liability. The total income amount or gross income is used as the basis to calculate how much the individual or organization owes the government for the specific tax period.